Last week we kicked off Bug Week... and then things got busy and I totally dropped the ball and didn't get all of my activities posted... so we're going to continue bug week this week! To see all of the fun things I was distracted by last week, head on over to my Instagram account. My kids are always sneaking muffin tin liners from my kitchen drawers and trying to find new and interesting ways to play and create with them. Their favorite way to use them is to make playdough cupcakes. Last week after reading a few of our favorite bug books, we decided to flatten some muffin tin liners and use them to build our own bug crafts! I really enjoyed crafting bugs together with my toddler and preschooler. They are big fans of all things creepy and crawly! To start off I had the kids flatten their muffin tin liners and press them down. Then we added glue to the paper and secured the muffin tin liners how they wanted them to be. For my toddler I just secured his muffin tin liners with glue ahead of time and he just added paint, eyes, and legs to it. After the muffin tin liners were glued, the kids added googly eyes!! I don't really try and limit them too much, so this is usually their favorite part. While the kids glued on eyes, I cut out little pieces of yarn based on the colored legs and antennae they requested for their bugs. My preschooler added glued to the body of her bug to put the legs on and I added glue for my toddler. I handed the kids yarn pieces and they stuck the yarn to the glued spots. I had to add a smiley face to my bug. We also got out the do-a-dot markers because my toddler LOVES them. We decorated the bodies of the bugs with dot markers and then we let everything dry. My daughter loved her bug craft so much she could hardly wait for the giant globs of glue to dry before she was carrying her bug all around the house. While we created we talked about how bugs have 6 legs and 2 antennae and we chatted about our favorite colors!! Crafts don't get much easier than this! To follow along with all of our other bug activities that we'll be sharing this week, pop on over to our bug week landing page. We'll be updating it every day. 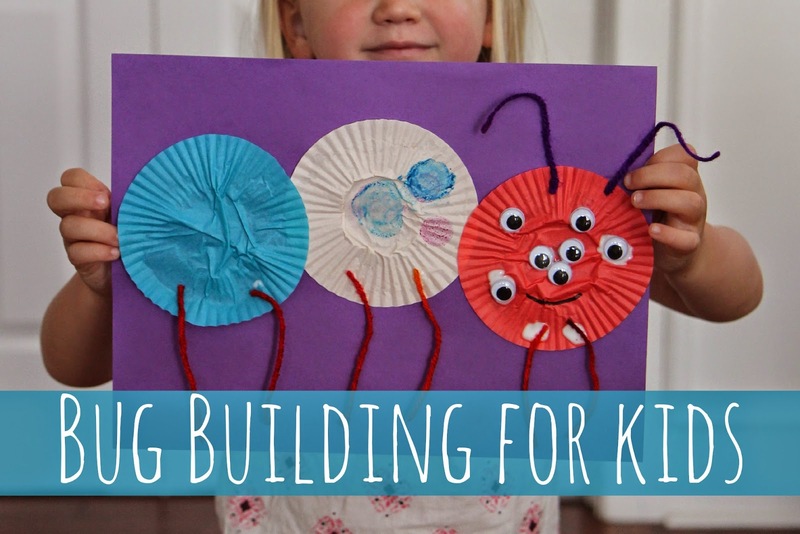 You can also check out our Bug Crafts and Activities pinterest board here. Also, we're doing a fun sponsored campaign with Great Clips this week! If you want a chance to win your back to school list, click here to enter to win.